Hyundai is helping the homeless this Christmas, supplying a fleet of vehicles for use by national charity Crisis. 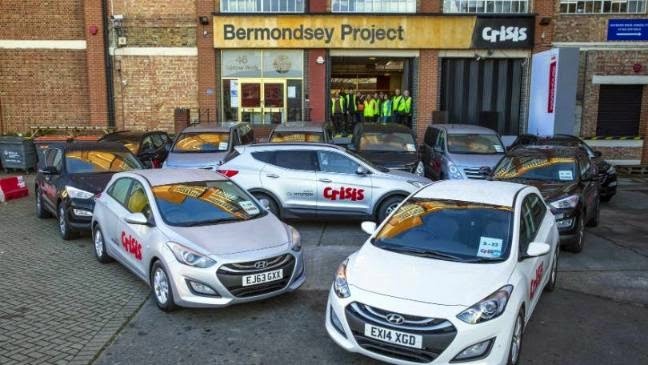 Crisis, the charity for single homeless people, will use 16 Hyundais to transport supplies and people around London during the festive period when the people it aims to help would otherwise be at their most vulnerable. A mix of i30 hatchbacks, i800 people carriers and, naturally, Santa Fes, will travel the streets of the capital between December 22-30. Jon Sparkes, Crisis' chief executive, said: "Christmas should be a time for family and friends, for warmth and celebration, yet for homeless people it can be one of the hardest times of year - a cold, lonely time to be suffered rather than enjoyed. "Crisis at Christmas is only possible due to the generosity of our volunteers and donors, such as Hyundai, who have come together to make Christmas happen for some of society's most vulnerable people." Crisis, says the firm's official statement, aims to end homelessness, helping those affected by offering heath, education and employment services. More than 9,000 volunteers will support around 4,000 people under the Crisis banner this Christmas. According to figures quoted in a Hyundai press release, more than 6,000 people slept rough in London "at some point last year".